Humans are social beings and need to be with others and form relationships but our relationship behaviors do not "come naturally" and they need to be learned similar to other social skills (Schneider, Gruman & Coutts, 2005, p.77). Many psychologists argue that the kind of relationships infants have with their primary caregivers is the blueprint for the later life relationships (Schneider, Gruman & Coutts, 2005). Behaviors in adult relationships' are influenced by the kinds of relationships and attachments they have experienced in their early years with their primary caregivers. This is the basic perspective of the theory of attachment styles that claims that the kind of bonds we form early in life influence the kinds of relationships we form as adults (Aronson, Wilson, & Akert, 2011). After observing interactions of infants with their mothers the developmental psychologist Mary Ainsworth and her colleagues (1978) identified three patterns of attachments that include the secure attachment style, anxious/ambivalent attachment style and avoidance attachment style (Schneider, Gruman & Coutts, 2005). Depending on the specific attachment style one was exposed to and learned as an infant will demonstrate specific adult attachment styles which involve the secure, preoccupied, fearful and dismissing adult attachment styles (Schneider, Gruman & Coutts, 2005, p.85). Therefore one can see that the interactions we first have with our primary caregivers could shape our relationships as adults. Additionally no one can doubt that children are first shaped inside their families and no one can underestimate the importance of the parents' role on a child's development and how it can affect their future development. This brings to mind the theory of parenting styles I learned in a previous psychology class. Diana Baumrind developed a theory of four distinct parenting styles which reflect the two dimensions of parenting which are responsiveness and demandingness (Arnett, 2010). 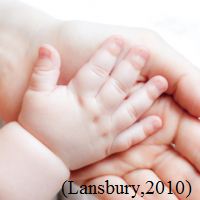 Responsiveness reflects the degree to which parents are supportive and sensitive to the child's needs and reflects the amount of love, warmth and affection expressed to their children (Arnett, 2010). Demandingness reflects the degree to which parents are demanding, have rules and high expectations for their children and it reflects the amount of controlling and monitoring parents have towards their children (Arnett, 2010). Based on these two dimensions the four types of parenting styles are authoritative, authoritarian, permissive and neglectful or disengaged. Parenting style has been found to greatly influence and affect adolescent development and also could probably affect the relationships with others in a similar fashion that attachment style may. As stated above early attachment is influential on one's life and children's attachment styles develop from a combination of biological influences and social learning (Schneider, Gruman & Coutts, 2005). The primary caregiver's behavior and interaction towards an infant could affect and shape their expectations and interactions with others throughout their lives. Regarding Ainsworth's attachment styles infants with secure attachment styles show trust to their caregivers, do not worry when being abandoned and view themselves as worthy and well liked (Aronson, Wilson, & Akert, 2011). They use their primary caregiver as a "secure base from which to explore" when all is well and use them for consolidation when frightened (Arnett, 2010, p.189). Infants with anxious/ambivalent attachment styles are insecure and anxious because they are not able to predict their caregiver's behavior since their caregivers demonstrate inconsistent behavior and affection (Aronson, Wilson, & Akert, 2011). Infants with avoidance attachment styles demonstrate suppressive feelings towards their caregiver and are discouraged from creating an intimate relationship with them as due to their distanced behavior have caused them to worry about rejection (Aronson, Wilson, & Akert, 2011). Depending of the attachment style that infants and young children have been exposed to they develop specific patterns of relationships that affect their responses to their adult relationship s. For instance a child that had a secure attachment with their caregivers would be able to develop lasting relationships as adults. Contrary a child who had an avoidant attachment with their caregivers would have difficulty creating long lasting relationships and would have difficulty to trust others. Research has been able to confirm that our adult relationships are shaped by our early patterns of attachment and with the ways of dealing with closeness, separation and love (Schneider, Gruman & Coutts, 2005). 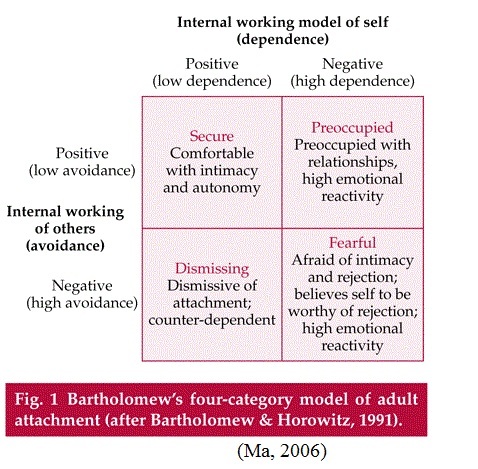 Furthermore Bartholomew (1990) identified four styles of adult attachment that are derived from the two dimensions that have to do with our self image and image of others (Schneider, Gruman & Coutts, 2005; Bartholomew & Horowitz, 1991). For the dimension of self image and image of others there are two levels which are the positive and negative and the combination of them composing the four patterns of adult attachment styles. Additionally this model, as indicated in the figure, includes the dimensions of dependency on the horizontal axis and avoidance on the vertical axis and both vary from low to high (Bartholomew & Horowitz, 1991; Ma, 2006). For instance the secure adult attachment style based on this model is characterized by positive self image with low dependency and by a positive image of others with low avoidance. Therefore one who has secure attachments will be comfortable with intimacy and autonomy (Bartholomew & Horowitz, 1991). From personal experience and from people I know I believe that attachment theory, and the above mentioned model, could accurately be applied to explain relationship patterns. Personally as a child I developed a secure attachment with my parents as they were responsive to my needs and caring, they were there when I needed them and they provided me with reassurance to explore my environment. As an adult I have been able to develop lasting relationships and I am comfortable with closeness, trusting others, and interdependence. When considering others from my close environment I also can relate their relationship patterns with the attachment theory and this appears helpful to better understand them. For instance a close friend of mine and previous colleague seems she has developed a preoccupied attachment style and this could explain her pattern of relationships thus far in her life. She has an anxious/ambivalent attachment style with her parents as a result of their job obligations, and their personalities were inconsistent regarding their affection towards her. As an adult she developed a preoccupied attachment style and she exhibits this attachment style towards both her friendships and intimate relationships. Particularly when it comes to her intimate relationships this type of attachment style is possibly responsible for her two divorces within a five year time frame and her being less satisfied with her romantic relationships. Whenever she entered into a romantic relationship she acted obsessive and was very preoccupied with her relationship. Most of her relationships were short-lived and even when she ended up getting married her first marriage lasted only one year and her second just a little longer. The main reason for this, based on what I learned from the attachment theory, seems to be the fact that she entered her relationships quite fast without first really knowing her partner and by being obsessive, anxious, jealous over her relationship it probably discouraged her intimate others and scared them away. Fortunately people are able to change and as one learns one's attachment style they could possibly unlearn it over time (Schneider, Gruman & Coutts, 2005). However in order to do so one needs to become aware of their relationship pattern and then decide what actually needs to be accomplished in order succeed this (Schneider, Gruman & Coutts, 2005). As people are exposed to different attachment styles from very young ages they also are exposed to different parenting styles, and as already mentioned Dania Baumrind developed a theory of four distinctive parenting styles. 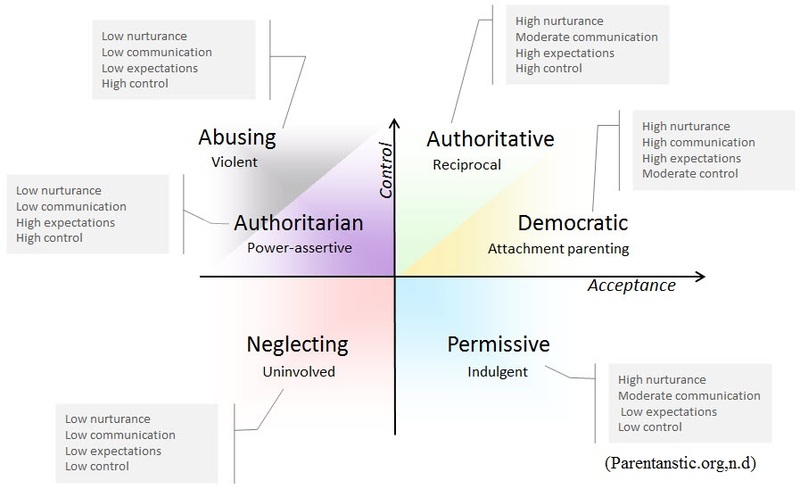 One of them is the authoritarian parenting style characterized by parents who are high in demandingness and low in responsiveness (Arnett, 2010). Authoritarian parents are strict and have high expectations from their children, have set rules and expect obedience without questioning and without really explaining their reasoning to their children (Berger, 2005). They are obedience and status oriented and expecting their orders to be obeyed without explanation (Darling, 2011). A child that grows up in a family environment where they do not have the opportunity to communicate, and constantly feel they have to act in a certain way, will have serious problems in many aspects of their development. They will grow up with low self-esteem, might be depressed, anxious and frustrated and they lag behind in social skills and social adaptability (Berger, 2005; Arnett, 2010). Another parenting style is the authoritative style characterized by high demandingness and high responsiveness (Arnett, 2010). Contrary to the previous style parents set rules and expectations but are open to discussion and negotiation as the parents are willing to listen to their children and guide them when questions arise (Arnett, 2010). Authoritative parents always maintain the power to say "no" but also they want their children to be assertive, socially responsible, self-regulated and cooperative (Darling, 2011). A child who grows up in a family where the parents utilize this style are more likely to grow up independent, have self-control, have more developed social skills, able to communicate and make friendships, have healthy relationships and emotional attachments (Arnett, 2010). From growing in a balanced environment they are less likely to have psychological problems and they become balance adults by themselves. The next two parenting styles are the permissive and the neglectful, or disengage style. Permissive parents are not demanding, they hardly ever punish their children and do not have a lot of control of their children as they usually let them do whatever they want (Arnett, 2010). They seem to want to be more like their children's friends instead of their parents. Children growing up in a permissive family will be more likely to have higher self esteem, but they will have poor emotional regulation, are immature and irresponsible (Arnett, 2010). They may show some developed social skills but actually do not posses them as they have been used to always getting what they want. The inadequate emotional regulation appears to be a problem for friendship formation (Berger, 2005). The disengaged or neglectful parenting style is characterized by parents who do not care about their children. These parents are low in both demandingness and responsiveness and they may seem little emotionally attached with their children (Arnett, 2010). Children growing up with this parenting style are exposed to an indifferent environment, without any guidance or support and are most likely to be depressed, impulsive and have poor social skills (Arnett, 2010). In general this type of parenting is associated with negative outcomes in a child's development in all domains of their life. These descriptions of the various parenting styles are fairly general and brief. There are also parents between styles or one parent may be of one style and the other of another style. However one can see that each child's development is affected by the parenting style of their parents and this could also affect their relationships with others as well. The parenting style a parent follows is influenced by various reasons such as personality type, psychological states, a child's behavior, education, socioeconomic status and much more (Arnett, 2010). Comparing the different attachment styles discussed previously with the different parenting styles I believe that it is possible for both to affect people's patterns of relationships as both could shape the development of a child. Considering the importance and significance of situational and social influences one can see that the initial social context of children is their families and their family environment is able to shape their development and influence the development of their personal and social relationships. Arnett J.J. (2010). Adolescence and Emerging Adulthood. Upper Saddle River,NJ: Prentice Hall, Pearson. Aronson, E., Wilson, T.D. & Akert, R.M. (2011). Social Psychology (7th ed.). Upper Saddle River, NJ: Prentice Hall/Pearson. Berger, K.S. (2005). The developing person through the life span (6th e.d.). New York, NY: Worth publishers.